WHILE WE WERE STILL UNDER ARREST, my father out of love for me was trying to persuade me and shake my resolution. “Father,” I said, “do you see this vase here, for example, or water pot or whatever. At this my father was so angered by the word “Christian” that he moved towards me as though he would pluck my eyes out. But he left it at that and departed, vanquished along with his diabolical arguments . . . .
Faithfully I promised that I would, for I knew that I could speak with the Lord, whose great blessings I had come to experience . . . . Then I made my request and this was the vision I had. I saw a ladder of tremendous height made of bronze, reaching all the way to the heavens, but it was so narrow that only one person could climb up it at a time. To the sides of the ladder were attached all sorts of metal weapons: there were swords, spears, hooks, daggers, and spikes; so that if anyone tried to climb up carelessly or without paying attention, he would be mangled and his flesh would adhere to the weapons. He called me over to him and gave me, as it were, a mouthful of the milk he was drawing; and I took it in my cupped hands and consumed it. And all those who stood around said, “Amen!” At the sound of this word I came to, with the taste of something sweet still in my mouth. I at once told my brother and we realized that we would have to suffer, and that from now on we would no longer have any hope in this life. When my father persisted in trying to dissuade me, Hilarianus ordered him to be thrown to the ground and beaten with a rod. I felt sorry for father, just as if I myself had been beaten. Then Hilarianus passed sentence on all of us: we were condemned to the beasts, and we returned to prison in high spirits . . . . The day of their victory dawned, and they marched from the prison to the amphitheater joyfully, as though they were going to heaven, with calm faces, trembling, if at all, with joy rather than fear. Perpetua went along with shining countenance and calm step, as the beloved of God, as a wife of Christ, putting down everyone’s stare by her own intense gaze . . . . Even injustice recognized justice. The military tribune agreed. They were to be brought into the arena just as they were. Perpetua then began to sing a psalm; she was already treading on the head of the Egyptian [dragon?]. Revocatus, Saturninus, and Saturus began to warn the onlooking mob. Then when they came within sight of Hilarianus, they suggested by their motions and gestures: “You have condemned us, but God will condemn you” was what they were saying. At this the crowds became enraged and demanded that they be scourged before a line of gladiators. And they rejoiced at this that they had obtained a share of the Lord’s sufferings . . . .
First the heifer tossed Perpetua and she fell on her back. Then sitting up she pulled down the tunic that was ripped along the side so that it covered her thighs, thinking more of her modesty than of her pain. Next she asked for a pin to fasten her untidy hair; for it was not right that a martyr should die with her hair in disorder, lest she might seem to be in mourning in her hour of triumph. Then she got up. And seeing that Felicitas [a Christian slave-girl also facing the beasts] had been crushed to the ground, she went over to her, gave her her hand and lifted her up. Then the two stood side by side. But the cruelty of the mob was now appeased, and so they were called back through the Gate of Life . . . .
. . . Immediately as the contest was coming to a close, a leopard was let loose, and [as Saturus predicted,] after one bite Saturus was . . . drenched with blood . . . . Shortly afterward, he was thrown unconscious with the rest in the usual spot to have his throat cut. But the mob asked that their bodies be brought out into the open. And so the martyrs got up and went to the spot of their own accord, and kissing one another they sealed their martyrdom with the ritual kiss of peace. The others took the sword in silence and without moving, especially Saturus, who being the first to climb the stairway was the first to die. For once again he was waiting for Perpetual. Perpetua, a Christian woman of noble birth, was arrested in Carthage. She was about 22 years old and was nursing an infant son. 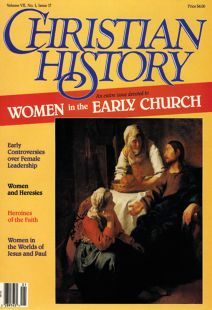 In what may be the earliest extant Christian document from a woman’s pen, she wrote her own story. The account of her death was, of course, added later.